My enthusiasm for Venice does not dim. Frequent visits over the past decades have not sated my appetite. They have fed it. And there is one piece of advice I always offer to those who are contemplating their first excursion to La Serenissima. It is this: do not try to do Venice on the cheap. The most beautiful city in the world has some wonderful hotels. After a heavy day of magnificent art and the highest culture, you need – for the sake of your soul – to be able to look forward to the calming and restorative effects of unalloyed luxury. It is right and you deserve it. I took my own advice and went to the wonderful Hotel Bauer. The Bauer was opened in 1880 and is still run by the family which bought it in 1930. 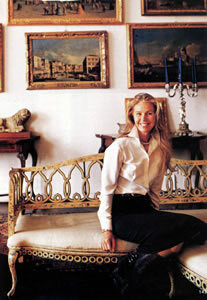 Indeed, the current owner and CEO, Francesca Bortolotto Possati (pictured), has impressed upon the establishment her own exquisite good taste and her respect for those aesthetic values which lie at the heart of the Venetian tradition. To talk to her is to converse with someone who has a deep love for her home town. I was not at all surprised to learn that she is involved with many of the most significant projects to restore and protect its heritage. 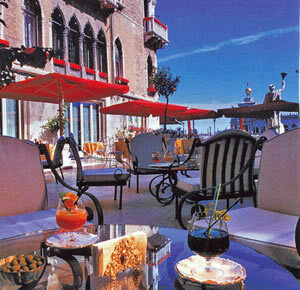 Within a few steps of St Mark’s Square, the Bauer is one of the great Venetian hotels. Yet, if you approach it on foot, there is a surprise. Its main entrance is a plain 1940s box. This is a great oddity in this town of elaborate decoration. Personally, I like it: in the same way that I like a lemon sorbet after three dishes of rich food – it cleanses the palate. 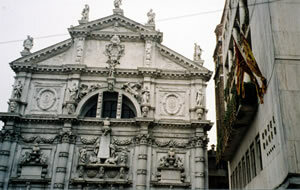 In fact, with its neighbour – the Church of San Moisè – having one of the most elaborate façades in Venice, the visual contrast the Bauer makes to its surroundings is highly satisfying. Once through the electrically-driven revolving door, the feeling of spaciousness is equally striking. (It is quite a brisk walk to the Reception desk.) 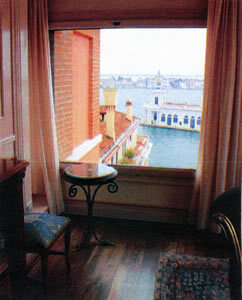 In Venice space is scarce, so to have so much suggests at once a manner of hospitality which is truly lavish. The Bauer is, as it were, two hotels. At the back of the 1940s building is an 18th Century palace, with a 17th Century façade, which looks out directly onto the Grand Canal. 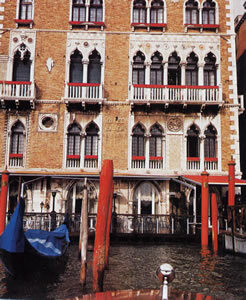 This is called Il Palazzo. It has its own entrance, but its restaurant (of which more later) is used by guests of both ‘halves’. I was billeted in the 1940s part. Room 241 was on the second floor. Regular readers will know that I am a taster of corridors. Here they were spacious and full of period charm, and they led to a gorgeous Art Deco staircase. (In fact, it was so gorgeous that I even walked down it one day, an event almost unheard of in the presence of a lift.) It was classified as a ‘Deluxe City View’ and was therefore 1,200 euros a night, bed and breakfast for two. (Ask about special offers.) The fittings and appearance of this air-conditioned apartment were of high quality. In its hallway were fitted wardrobes, containing a personal safe. Within the bedroom – which was of medium size, I thought about thirteen feet by eleven – the dark blue and gold silk on the walls, contrasting with the bleached woodwork, set off the pieces of reproduction furniture very well. Lighting was provided by 4 lamps and 3 spotlights. There was one easy chair and one wooden armchair. 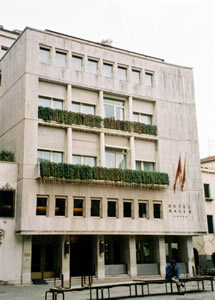 Through sliding glass doors was a balcony, overlooking a canal, with, beyond, the designer shops of the via XXII Marzo. The bathroom was a modestly-sized chamber of grey marble, spotlights and mirrored walls. It contained one wash basin, a loo, a bidet and a bath tub of acceptable length. My bed, as so often nowadays, was too hard for my back. But the Bauer is a place which strives to please, and the good people of the Housekeeping Department did their magic, so that the required softness was achieved, and my slumbers were deep and satisfying. The memory of this kindness prompts me to recall the level of service I encountered throughout the hotel. It was exemplary. 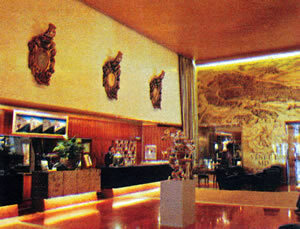 I will make special mention of the exceptionally helpful Concierge desk and of one of the managers, Simone Moretti. 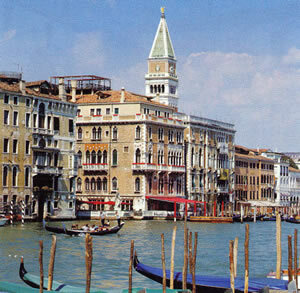 Mr Moretti took me over the water to the Guidecca to look at another of the Bauer hotels, the Palladio. 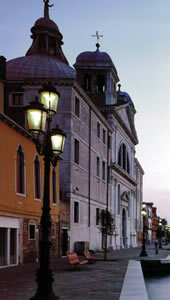 It is a converted convent and some of its rooms enjoy views over to St Mark’s Square which are ravishing. He even managed to get me into the attached church (pictured – supposedly designed by the great Palladio himself), which is normally open only for one Mass on Sundays and has been under restoration since before I set foot in Venice. My eating was done at the De Pisis Restaurant in the Il Palazzo part of the Bauer. (Filippo De Pisis is the name of the artist whose large canvas, depicting a still life in an artist’s studio, adorns one wall of the final dining room. De Pisis was a Metaphysical painter and a friend of Giorgio di Chirico.) This room, overlooking the Grand Canal, is a lovely rectangular space, with a marble floor, gold walls, gilt-framed mirrors and a turquoise ceiling. It sounds rather over-the-top, but – believe me – it works very well. And the waiters work very well, too. Here I breakfasted each morning at table number 54, as I looked across the waters to the extravagant stonework of the church of Santa Maria della Salute. The wine list has 160 offerings, all Italian, apart from the champagnes and the sweet French wines. Prices range from 30€ for a red from Puglia to 1,100€ for the 1995 Krug Clos de Mesnil champagne. Other bottles to catch my eye were: 1981 Yquem (580€), 2007 Tignanello (136€) and 2007 Sassicaia (316€). There is a wine estate owned by the family in the Friuli region, Colmello di Grotta, which produces 100,000 bottles a year. I noticed its 2008 merlot on the list at 38€. My own drinking took me to Sicily for the ever-reliable, big, bold Planeta chardonnay (2008 - 48€) and then to the Trentino for an austere, full-bodied red, which opened up pleasingly after its decanting (Granato, Foradori, 2004 - 85€). After this dinner I wandered through the quiet streets and thought myself greatly privileged. And you, my friends, can be privileged, too. Heed my advice. Do not do Venice on the cheap. 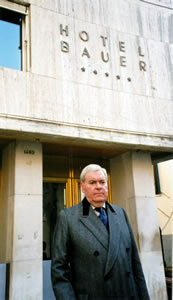 Go to the Bauer. And there relax in luxury, elegance and style. Campo San Moisè 1459, San Marco, 30124 Venice, Italy.